My daughter has one true passion: FOOD. It’s undeniable. Her world revolves around it. If I gave her the option of getting a new toy or going out to eat at a restaurant, the foodie in her would prevail every single time. Over the years, Tot has expressed an overwhelming desire to learn how to cook. I know a thing or two around the kitchen, but I support her passion of the culinary world, and I have always kept my eye out for an age appropriate cooking class. Recently, Sur La Table announced a partnership with Kiddo’s other true love, American Girl. 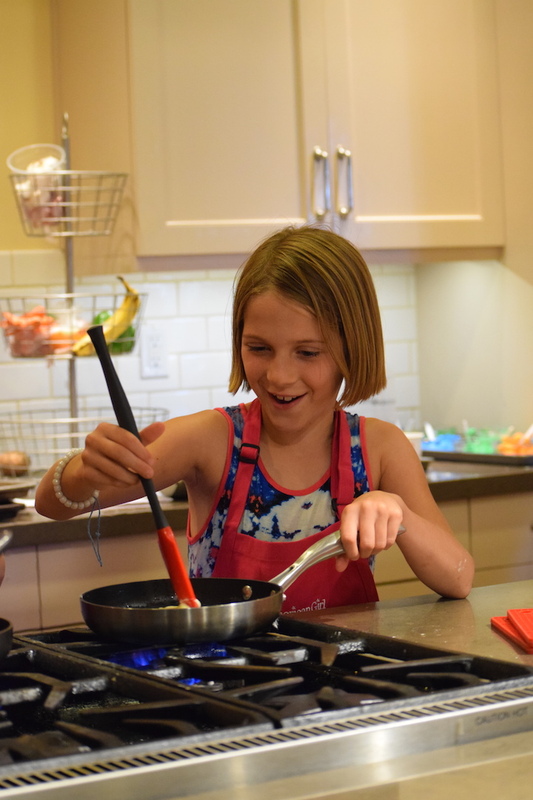 For a limited time, the store is holding American Girl: Make & Bake French Treats baking classes where children learn the art of making french pastries from scratch. This is pretty much a dream come true for Tot, so we signed her and her 2015 Girl of the Year doll Grace Thomas up the moment we caught wind of the program. I’m so happy we did. The classes have been sold out with a waiting list of 25 – 30 deep! The class ran just shy of three hours inside Sur La Table’s on-site professional kitchen. Sixteen lucky girls spent the afternoon in teams of four learning all about kitchen safety and proper cooking techniques before having the chance to bake their very own Chocolate-Glazed Eclairs, Eiffel Tower Sugar Cookies and Apple Tartlets. It’s a real treat as a parent to watch your child’s dreams unfold. The sheer joy Kiddo found at the helm of a Professional Kitchen-Aid Mixer filled my heart with joy. She said the only thing missing was her bestie (and music.) We can’t forget the music. Our instructor, Chef Tracy Rivera was absolutely fabulous. She had patience with mini pastry chefs and a great disposition. She really ran an organized prep kitchen and knew how to engage with the girls. The area is set-up as a test / stadium kitchen with large screen monitors so parents are welcome to sit and watch the kids, or you can leave and come back in a few hours. For this class, the seats were taken up by some very special guests! And the girls did not leave empty handed. American Girl goody bags came with a full-size American Girl apron embroidered with the AG logo, an Eiffel Tower cookie cutter to take home, a 10% off Sur La Table coupon and recap with recipes of American Girl: Make & Bake French Treats. While we were hanging out, Coco also had the opportunity to assist Chris make the most amazing sliders we’ve ever tasted. He used Nancy Silverton’s special mix ground beef from The Farmer’s Market and blended in Steak Rub by Tom Douglas. While they were grilling up, he brushed each side of the burger and some fresh veggies with Spicy Red Chili Teriyaki Sauce also by Tom Douglas. Add those fresh grilled teriyaki glaze peppers to the slider and friends, you have an instant party! We didn’t even make it clear out of the store before Tot was ready to sign up for Sur La Table’s Kids & Teens Summer Cooking Series. She is already to participate in the Cooking Around The World where she will explore making dishes from: Mexico, Japan, France, Italy and desserts from around the globe. She will follow up with The Science of Cooking where she will master Kitchen Chemistry, Powerful Proteins, Plants We Eat, Magical Enzymes & Dairy, and Crazy for Carbohydrates. I can’t wait to share the sessions with you! You can bet the day didn’t end there. Because what would a proper day at The Grove be without swinging by the mothership American Girl Place to visit our favorite personal shoppers: Karina and Winnie! Tot is all into Coachella this year, so I’m not surprised she picked Julie’s maxi dress. It’s right up Tot’s style alley. Thank you Sur La Table for having The JetSet Family participate in such a fun event! Promotional consideration has been furnished by Sur La Table. On occasion, contributors of The JetSet Family receive products, compensation and/or services gratis or at discounted rates. This practice does not hinder the influencer’s point of view. All descriptions are factual and accurately reflect the overall experience. This post may contain affiliate links. Oh so fun!!! I’ve not had the pleasure yet of visiting the store in Dallas, or even taken my grand daughter. She might be too old now. That looks like so much fun. Oh my gosh this is SUCH a cute idea! I have all boys, but I know a few little girls that would love to do this! I will have to tell them about it and see if we have one of these close to us! OH man, my daughter loves baking and we have one near us in Kirkland. This is awesome. But she’s only 5, hmmm. I guess another year. But thanks for sharing. I had not heard of these and it’s really cool that they’re doing it! This looks so fun! My girls would love this as they are already kitchen bugs and love to be in there cooking and creating. I am glad they have fun things like this for kids. What an amazingly fun event. I love the photos, the look of sheer joy and determination on her face is priceless. My granddaughter would love taking Grace to this class. They love to bake. Food, kids and travel are such a good combination. And to have age appropriate structuring to develop their talent and enthusiasm and skills is such a wonderful idea. Giving kids the power to create their own food is such an important stepping stone for their future health and wellness. Our daughter loves to get involved in cooking too and will happily come over and get involved when we bake sourdough, and make fermented foods on our months long family camping road trips. We encourage this, and are always happy when we find activities and posts like this that allow children to do something a little more active than visiting another zoo. I’m sure it’s the next era of family travel right there.